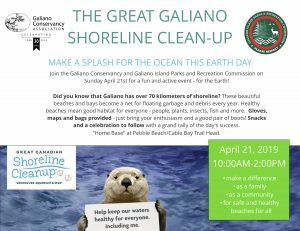 Make a splash for the ocean this Earth day! 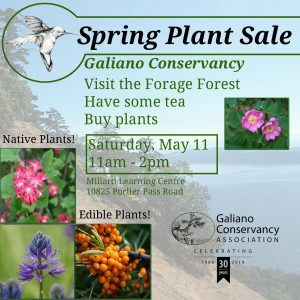 Join the Galiano Conservancy and Galiano Parks and Rec for a a fun and active event - for the Earth! Gloves, maps and bags provided - just bring your enthusiasm and a good pair of boots! Snacks and a celebration to follow. "Home bases" at Pebble Beach/Cable Bay Trail hear and Sticks Allison Shore Access. Sign up here! Montague Harbour Provincial Park, Montague Park Rd. 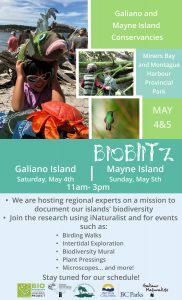 Galiano and Mayne Island Conservancies are co-hosting a Bioblitz this May! We are hosting regional experts on a mission to document our islands' biodiversity. Join the research using iNaturalist app and for a community event at Montague Harbour Provincial Park May 4th! What is Science Camp for Teachers? It’s three days of workshops, collaboration, and outdoor fun for teachers who specialize in the science curriculum. 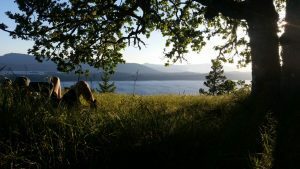 Through guest speakers, hands-on workshops, group discussion (and, of course, hiking, exploring, and eating together) we will share ways to bring the science curriculum to life. Learn more here.